Enterprises play a key role in creating productive and decent work that helps lift people out of poverty. Learn more about the work of the ILO to promote sustainable enterprises at www.ilo.org. Getting involved as an implementing organization or C-BED field partner is easy. Your first step should be to review the promotional materials available and download the different training materials to form a better understanding of the training methodology and expected outcomes. To contact other organizations working on C-BED in Asia and the Pacific, register to become a member of the C-BED Community of Practice and navigate the relevant discussion forums. Organizations interested in getting involved with the C-BED program are encouraged to organize a pilot of the training with a group of key beneficiaries. Pilot programs should be arranged in settings that reflect how the program would be run if successful. A practical guide for to support organization planning the implementation of C-BED training has been developed. The guide provides support on areas of implementation such as selecting facilitators and participants, tailoring the program to meet your needs, scheduling and logistics for delivery, and measuring results. When identifying your participants it is important to consider the background and motivations of those who want to be involved. This information helps organizations to make a decision on which C-BED training package to pilot. The ILO recommends training be delivered to groups of 5 – 8 people. Currently there exists two core packages, one for Aspiring Entrepreneurs and the other for Small Business Operators. A separate training package exists for Manufacturers as well as an adapted training for Migrant Women’s Empowerment. After identifying your participants and deciding on a training package, the ILO encourages organizations to get in touch to learn about the latest updates on training and best practices, to identify networking opportunities with other C-BED collaborators in the field, or simply to ask questions. The implementation guide has been developed to provide additional support for organizations. ILO can provide further resources for orienting the facilitator of your pilot to the role they will play and how best to make use of the manual provided. Tools for evaluating the training have been developed by ILO and are included in the packages. This information is useful for understanding the outcomes of training and opportunities to improve and by sharing with ILO the community of practice is strengthened. The ILO welcomes expressions of interest from organizations in the field working to promote enterprise development training and opportunities for enhanced livelihoods and empowerment of poor, vulnerable and marginalized groups. 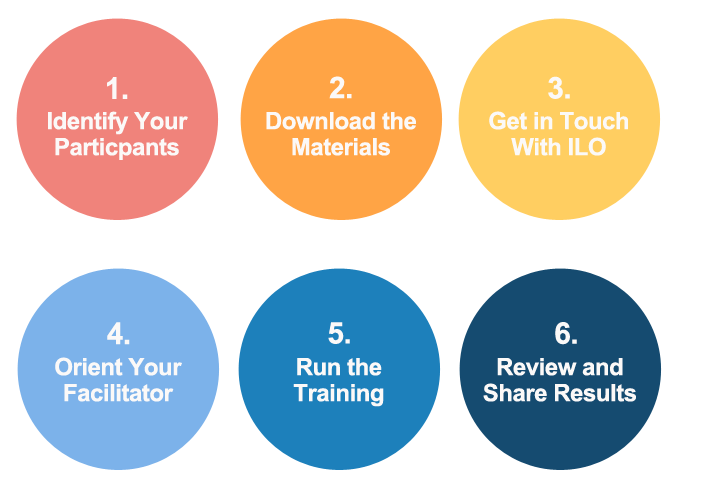 To become a field partner for C-BED, potential delivery organizations are free to download the materials, review, and adopt without permission from ILO. The C-BED materials are licensed under Creative Commons. Any adaption of the materials should acknowledge this ownership. Individuals interested in being a facilitator for C-BED training should first review the promotional and training materials to gain a better understanding of what this role involves. It is important to remember that the guide manual for facilitators contains recommendations as a foundation and starting point, but you should adapt the training as you see fit. Some sessions may be more relevant to your group than others. You are welcome and encouraged to adjust session timing or content accordingly. This empowers you with a great deal of responsibility over this program. Again though, you are not expected to act as a teacher or instructor. The training materials developed and your knowledge of the community provide you with all the tools you need to make this training program work. If you are interested in getting involved but are not associated with an organization or association that can support the training, you may be able to identify an opportunity to facilitate through an existing field partner in your location by joining the C-BED Community of Practice and reviewing the latest updates on C-BED in the field. ILO encourages facilitators to work with existing field partners or organizations and associations because this promotes sustainable programs are available to the community. If you are unable to identify an opportunity to collaborate with existing organizations, contact the ILO C-BED project team to discuss ways you can be supported to get involved. If you are interested in becoming a C-BED learner, you are best to identify opportunities to join training through existing field partners in your location. You can information about these partners by joining the C-BED Community of Practice and reviewing the latest updates on C-BED in the field.